The first time I heard someone suggest the Bible supported gender-equal leadership in the home and in the church, I'll admit I was skeptical. Sure some of the verses they pointed to seemed to support their point of view, such as Galatians 3:28 or Genesis 1:27-28. But the traditional male leadership/female submission position still appeared to fit better with my understanding of the general theme of Scripture. My choice appeared to be between a few well-formulated arguments for equality, or the overwhelming majority of the Bible pointing to male authority. Since my conversion to egalitarianism, I have come to find my feelings were not at all uncommon among other Christians. Many times I have presented someone with an argument for equality only to hear my old beliefs echoed back to me. And like me, few are willing to simply brush these concerns aside without a compelling rebuttal. But now—thanks to Austin Stouffer's new book 95 More for the Door—egalitarians can turn the "general theme of Scripture" argument on its head and prove the Bible is actually overflowing with pleas for equality. 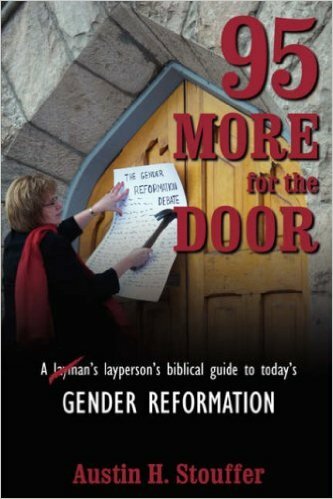 Modeled after Martin Luther's famous "95 Theses," Stouffer takes the reader on a journey through the Bible, stopping along the way to point out 95 different passages in support of his belief that "God intended men and women to be equally affirmed and gifted, whether to lead in society, to parent in the home or to minister in church." Filled with solid, logical arguments and written in a straight-forward, relaxed style, 95 More for the Door is a strong tool egalitarians can use to help reform the church's teaching on gender. Starting with Genesis and ending in Revelation, Stouffer touches on dozens of different issues relating to gender equality. Yet despite this diversity, there are several themes he returns to time and time again. He uses Scripture to demonstrate that spiritual gifts—including the gift of teaching—are distributed to believers without regard for gender and may be exercised by men and women. He calls attention to the numerous passages referencing women leaders, including prophets, judges, teachers, deacons, elders, apostles, ambassadors, and priests. In perhaps his most effective argument, Stouffer repeatedly points out how leadership abilities are not innate to women or men, but come directly from God. We are not the message, he says; we are the messengers, merely the instruments through which God speaks. So why would God—who takes pride in using unlikely instruments to deliver his message—refuse to speak through women in the same way as men? Even if women are not designed for leadership, as traditionalists claim, couldn't God use them anyway, making his power perfect in their weakness? These points provide powerful support for Stouffer's contention that in Christ, "there can be no second category of God's children." Following in the footsteps of Martin Luther, Stouffer has created a book designed to help "ordinary people discuss, question, understand, interpret and practice what the Bible really means." Instead of overloading the book with Greek-word studies and lengthy discussions of theology, Stouffer opts for a more general overview of the issues and utilizes an easy-to­ understand style. Likewise, the format is very reader-friendly. A small passage of Scripture and brief explanations follow each thesis, creating 95 short, relatively independent chapters. Readers can begin anywhere in the book, read as much or as little as they wish, and still come away with a challenging and engaging experience. While this format and style make the book useful for those relatively unfamiliar with the debate, it is not without shortcomings. The chronological format of the book often leads to repetitiveness, which—though useful to reinforce concepts for the new reader—may become tiring for those who are more familiar with the issue. It also leads Stouffer to spend too much time on some less persuasive points (such as the devotion of two theses to the fact that Jesus was born of a woman) and too little time on some extremely valuable points (such as his grouping of Old Testament women leaders Deborah, Huldah, and Miriam together into a single thesis). Finally, Stouffer doesn't pull his arguments together into any sort of strong conclusion, thereby missing a good opportunity to persuade any still-undecided readers. Despite these limitations, 95 More for the Door is an excellent resource for anyone interested in the cause of equality. In a field where the literature is usually aimed at biblical scholars and can quickly overwhelm beginners, Austin Stouffer has written a book that is accessible to the common reader, but still manages to demonstrate the breadth of support bolstering his argument. When a friend of mine, who was relatively unfamiliar with the subject, picked the book up off my coffee table, it took her only moments to find ideas about equality she had never heard before, and it wasn't long until a fruitful discussion about gender roles began. It seems 95 More for the Door is already helping to bring about the "gender reformation" Austin Stouffer has long awaited.